Idly scrolling on Saturday morning, August 29, avoiding work, I come across them. Flinching, I share. Try to write a comment but nothing sounds right. Everyone says: ‘No. Words.’ Which does not mean that they have nothing to say, it’s just what you say online when things like this happen. Against that, the now-standard academic response is to point out that everyone is talking about them. That they are everywhere. In the Internet era, perhaps this less of a revelation than it once was. Neither approach feels right any more. This is about finding the words because they are all we have. We have to keep looking, to remember the people that died. And to begin to imagine what we can do politically with the mass of digital images. I’m looking at a set of photographs posted to Facebook (taken down by Facebook admins on August 30) by the Syrian photographer Khaled Barakeh. I don’t know him, they were shared by a mutual friend based in the U.K. The album has been shared over 100,000 times in a day. 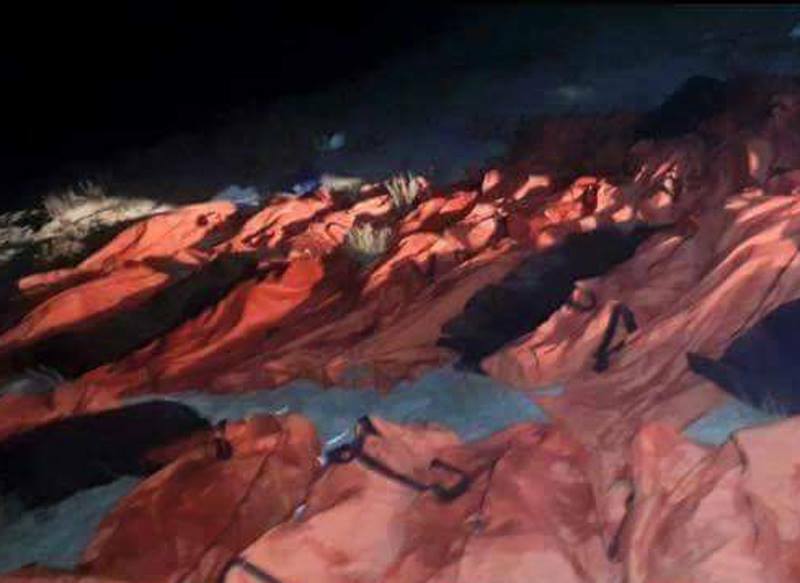 Last night [August 28, 2015] more than 80 Syrians and Palestinians refugees have drowned in the Mediterranean close to the Libyan shores trying to reach Europe. Whether he took these pictures or found them elsewhere, he doesn’t say. My guess is that he has edited press photographs, perhaps those of AP photographer Mohammed ben Khalifa. It doesn’t matter. At least until the inevitable trolls start claiming they are fakes. That usually comes on day 4, so we’re not there yet. In advance, Facebook is now deleting people’s re-posting of the album, a self-censorship for the era of social media oligarchy. There are seven photographs altogether. Six show a drowned child, floating in the foam of a beach somewhere. Barakeh calls the sequence Multicultural Graveyard. I think we’re supposed to hear this both ways. 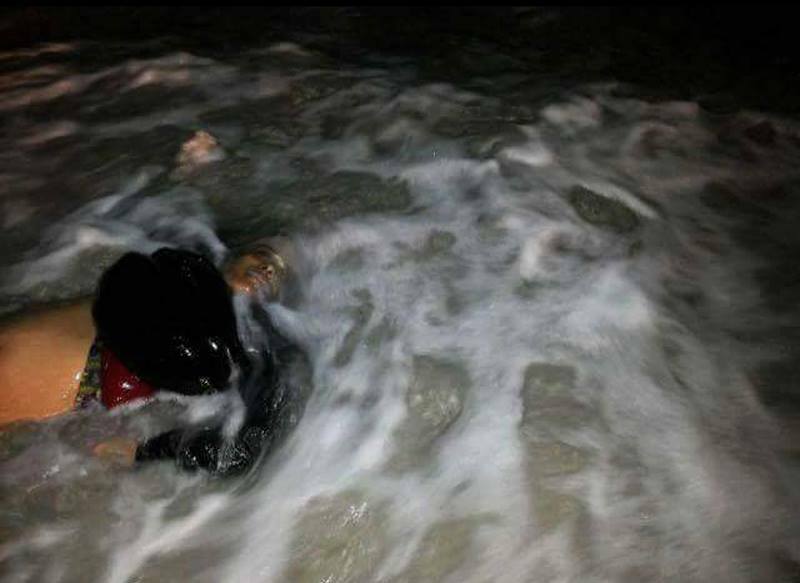 There are many people from many cultures drowned. And the European banality of multiculturalism, that too has died, as we see in the final photograph of the set, below. The children were Palestinians and Syrians. The pictures do not show mutilated or naked bodies. The faces are oddly at rest. As edited here, there is a certain beauty to them. For some, it is still wrong to show them. Many more see them as sacred. In the comments online, so many have called them ‘angels.’ From Wim Wenders to Christian fundamentalists and sci-fi fantasy novelist China Miéville, there is a culture-wide fascination with the angel in Euro-America. Add to that: A Christmas Carol or It’s A Wonderful Life as cinematic mythology. In Palestine, those who die in the struggle are often memorialized as martyrs, their photographs made into posters, their martyrdom videos recorded before actions sold in shops. To the West, these are unmistakeable signs of fanaticism and fundamentalism. It’s hard to imagine because, perhaps, we don’t ‘see’ Christian iconography. Or as Miéville might put it, we ‘unsee’ it, in the sense that we know it is there but consciously avoid noticing it. Like the thousand-yard stare we do for the homeless or subway begging. The ‘angels’ comments register as the ‘normal’ that our own mythology produces. Similar concepts of the sacred in an Islamic context appear grotesque. Barakeh is an accomplished artist, widely exhibited. In 2014, he created a sequence of work in which photographs of casualties, often children, were cut out of the main image. 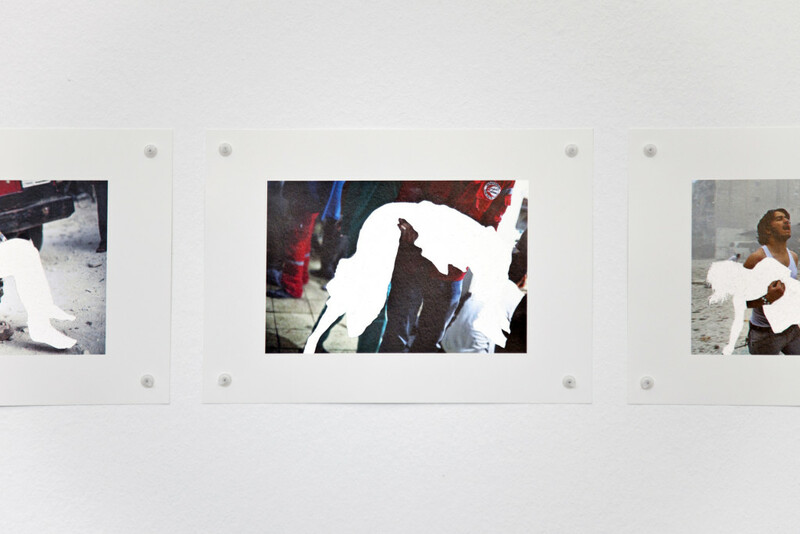 Exhibited in Frankfurt, Barakeh writes that his work: ‘presents by omission exactly what institutions of power and secrecy wish to keep hidden.’ So too with the Multicultural Graveyard. These are works in a tradition of death in the Middle Passage(s). I think of Turner’s Slavers (1839), as I so often do. In turbulent water, an African body thrown off the slave ship is suspended between life and death, between the beginning of enslavement and a temporary freedom. The fish, birds and the sea monster Typhon swarm around them. What if, I wonder, they are not eating but trying to support them, to keep the weighted body at the surface? These little fish and gulls are not flesh eaters. Those are the slavers. The twenty-first century Middle Passage is shorter but seems to be all too fatal. 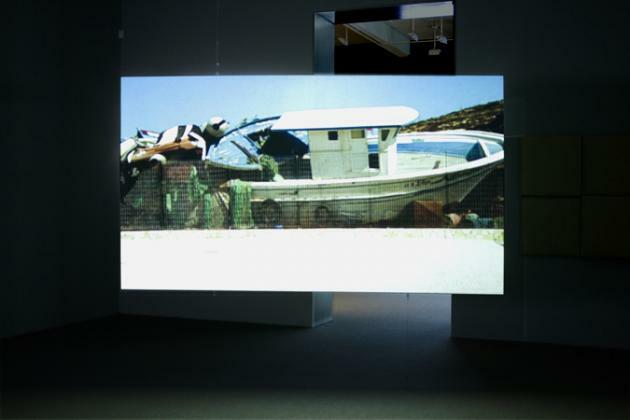 In 2007, Isaac Julien made a powerful film Western Union, Small Boats. It depicts the wreckage of refugee boats, piling up on the coast of Spain in Julien’s formal but evocative style. It seems to anticipate the photographs we are struggling to look at today. There’s a difference, of course. 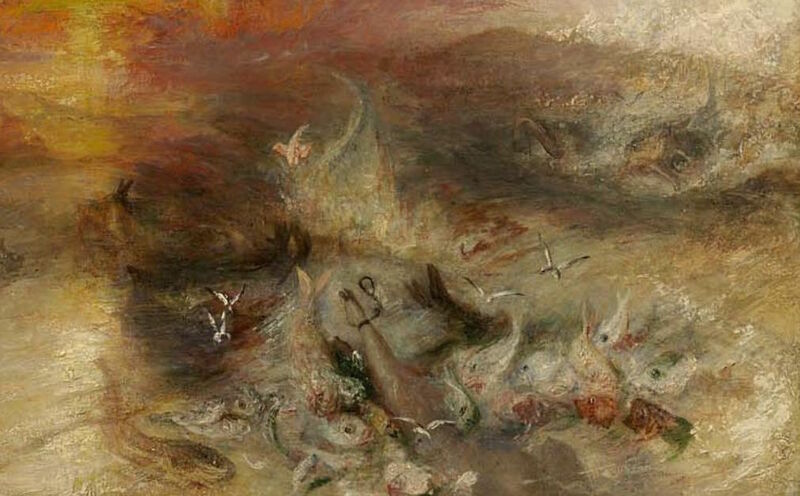 Turner’s painting appeared at the Royal Academy in London and was bought by John Ruskin. Sixty years later it reappeared at the Boston Museum of Fine Arts and you still have to visit to see it. Julien’s work has to be seen in a gallery show as well. Barakeh has posted his photographs to the mass reality show that is Facebook. There’s a whole other set of contexts for that. Financial globalization has a love-hate relationship with the sea. In its formative moments, Steven Spielberg’s 1975 film Jaws coined the catchphrase: ‘Just when you thought it was safe to go back in the water.’ For goods, the sea is a necessary conduit. For people, it’s supposed to remain an impenetrable barrier. Remember the classic example of globalization? The fish that’s caught in the Arctic, frozen, shipped to China, filleted there and shipped back to the U.S. to be eaten. Refrigerated containers cross the world carrying such things. And then a no-longer current version of such vehicles became the tomb for seventy-one refugees. 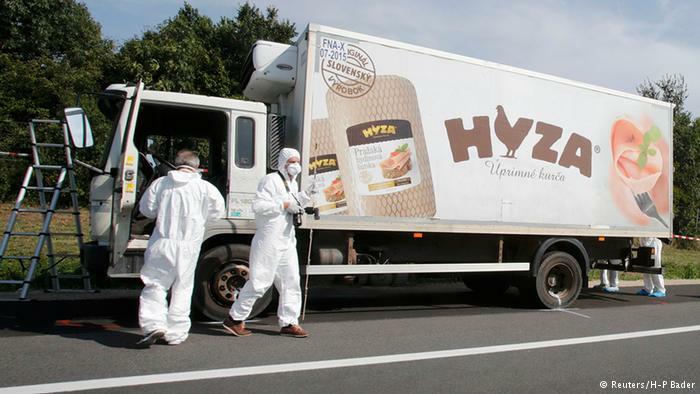 It was marked up as a Slovakian poultry firm, carried Hungarian plates and was abandoned in Austria. The people inside were no doubt the usual mix of refugees from global war zones from Afghanistan to Libya and Syria. Now the men in hazmat suits and the forensics people have turned the vehicle into a crime scene. Only it’s everywhere, every day. For most of us, these threads come together in our social media ‘feeds.’ Over 900 million people a day access Facebook, with 386 million being in Europe or North America. There are Facebook groups for refugees, who use smart phones to navigate their journeys and send messages home. So there are words for the refugee crisis being sent by the refugees. And also by the people smugglers. Tragically, some people are looking at these photographs with the worst shock of recognition possible. We cannot hide behind ‘no words’ or the academic technicalities of discourse analysis. Some key parts of the new global reality are happening online, where so much social life now happens. It’s up to us to work out what that means. On Sunday August 30, Facebook deleted all posts with links to the Multicultural Graveyard. This censorship of the public square that social media have become shows how the global tech corporations now control what we may see and what is forbidden. Barakeh’s project is scrupulous, let it be stressed, not to shock beyond making us confront what a news headline ’80 Drowned’ really means. The banner image for this site is itself a banner: “When We Breathe, We Breathe Together,” used by NYC2Palestine in the Millions March for #BlackLivesMatter. After covering the entire march from Washington Square to the Pink Houses, where Akai Gurley was killed by police as he came down the stairs with his family, the banner appeared in the Smack Mellon exhibit Respond. Now we have learned a new resonance, a new reason to march behind it. And a new awfulness to #ICantBreathe.